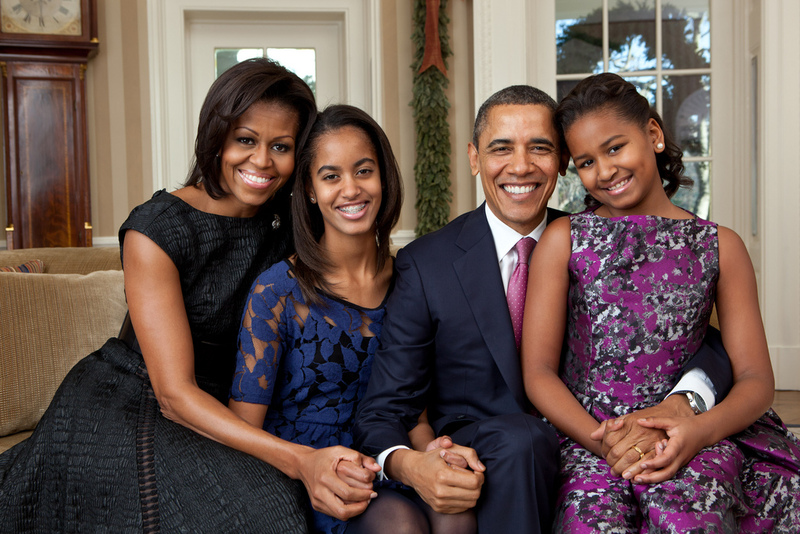 Michelle Robinson Obama was born in DeYoung, Illinois, on January 17, 1964, to parents Frasier Robinson III and Marian Shields. She grew up in Chicago’s South Shore neighborhood with her older brother Craig, attending Chicago Public Schools and quickly joining gifted classes in elementary school. 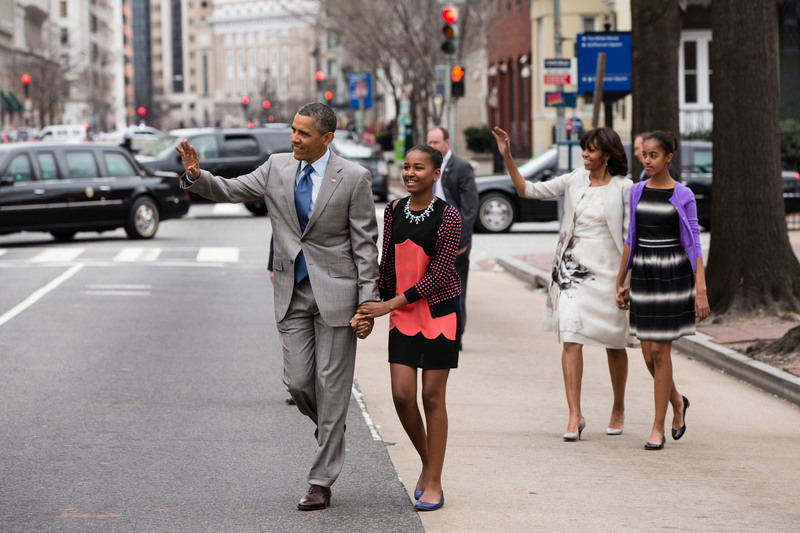 In 1988, Mrs. Obama received her law degree from Harvard Law School. 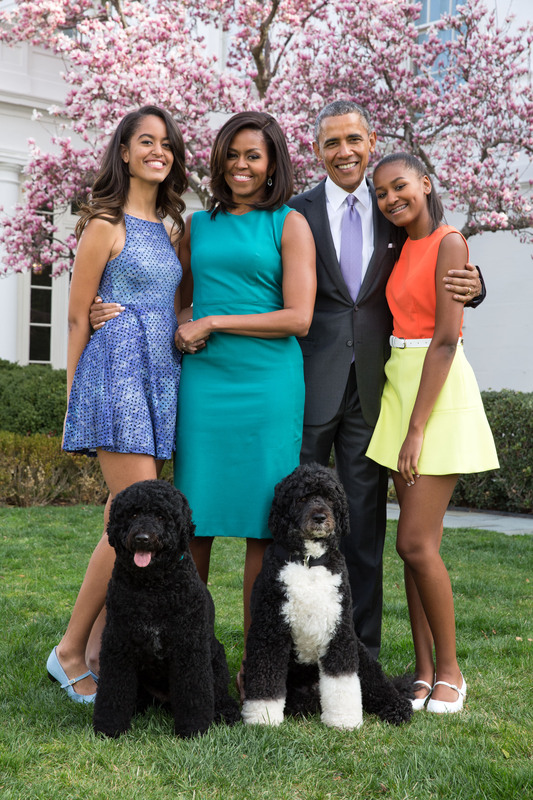 Following graduation, she was hired by the Chicago corporate-law firm of Sidley & Austin, where she specialized in entertainment law, and was ultimately assigned as advisor to summer associate Barack Obama. 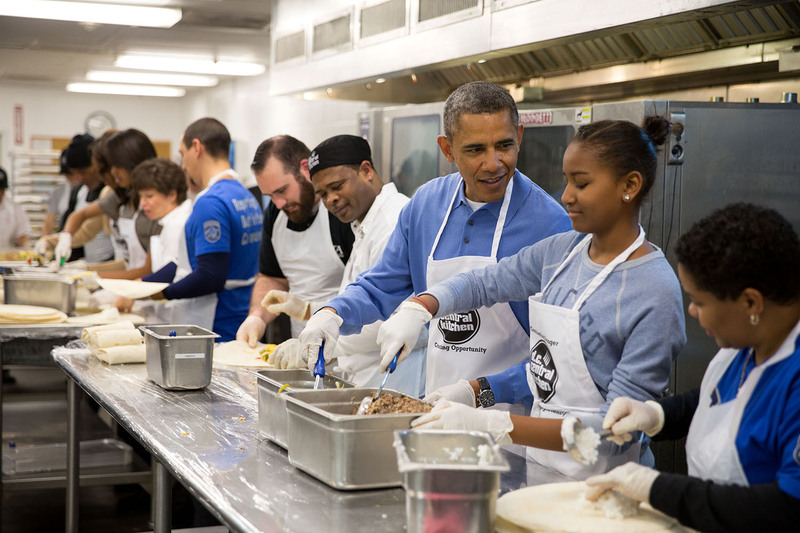 After leaving Sidley & Austin in 1993, Mrs. Obama worked for the city of Chicago’s Department of Planning and later the national service organization Public Allies. 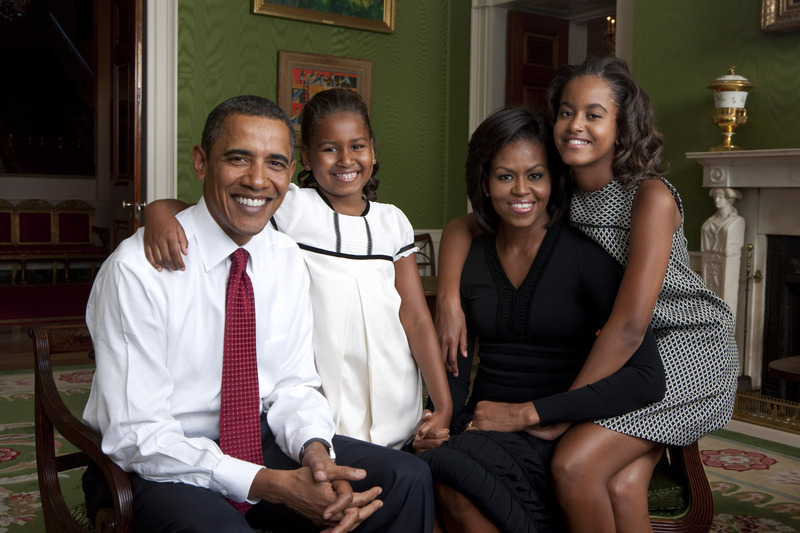 Mrs. Obama accepted the position of Associate Dean of Students at the University of Chicago in 1996, where she also served as director of the University Community Student Center. In 2002, she became the University of Chicago Hospital’s Director of Community Affairs, and was promoted to Vice President of External Affairs and Community Relations in 2005. At the 2008 Democratic National Convention, Mrs. Obama was introduced by her brother, Craig Robinson, and delivered an address to the convention. 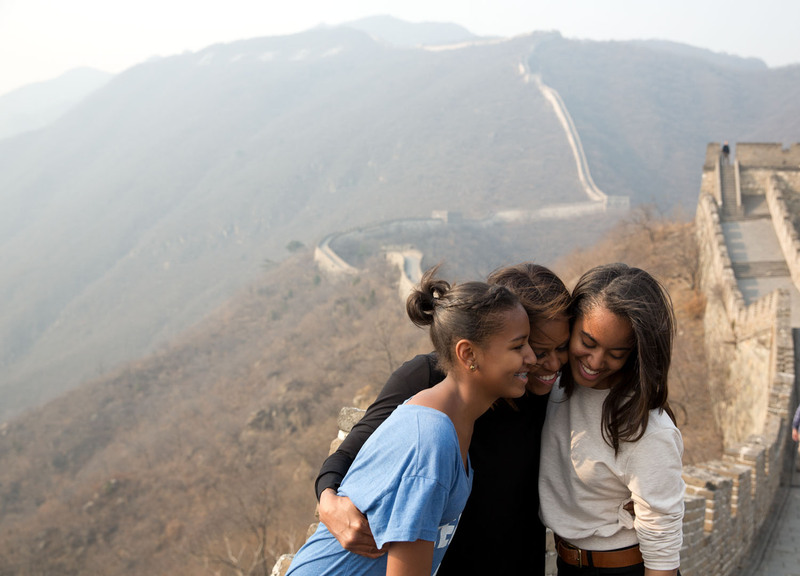 During her husband’s administration, Mrs. Obama launched multiple initiatives. Let’s Move! targeted childhood obesity by encouraging kids to participate in physical activity and revamped US school lunches to include more nutritious food options. 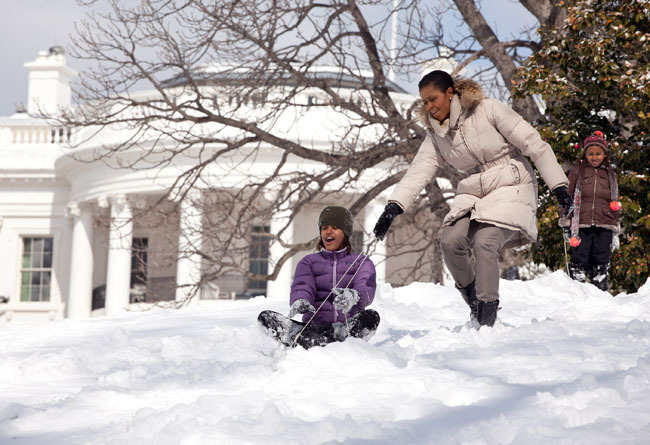 To illustrate healthy meal planning at home and encourage Americans to learn about where their food comes from, Mrs. Obama planted a vegetable garden on the grounds of the White House in 2009—the first since Eleanor Roosevelt’s Victory Garden during World War II. Harvest from the gardens were cooked in the White House kitchen and provided to Miriam’s Kitchen, a local organization serving the homeless community in Washington, DC. 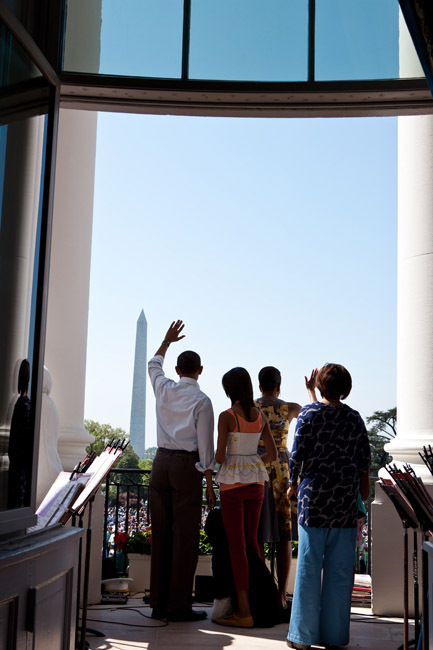 Detailing her efforts in establishing the White House kitchen garden, Mrs. Obama published her first book, American Grown: The Story of the White House Kitchen Garden and Gardens Across America, in 2012. In 2011, Mrs. Obama collaborated with Mrs. Jill Biden to launch Joining Forces, an initiative rallying American civilians and their organizations to support US service members and veterans and their families. 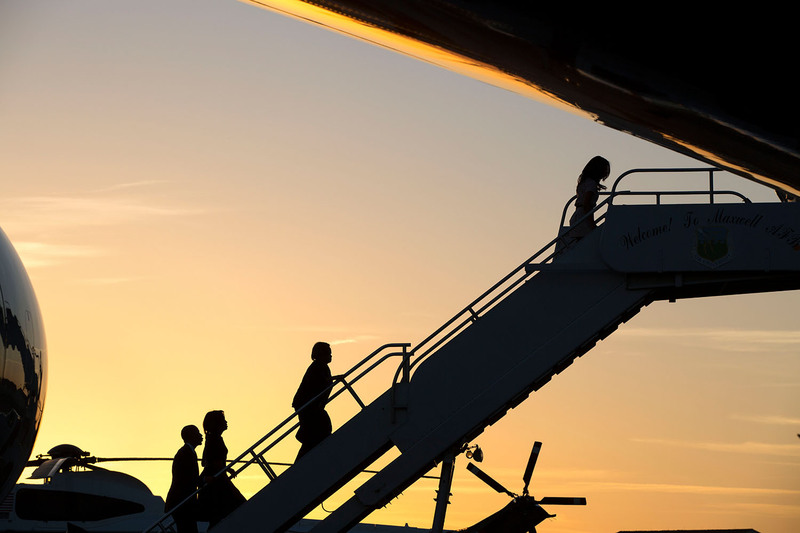 The initiative used a three-prong approach—employment, education, and wellness—for organizing national efforts to provide additional tools to the US military community. 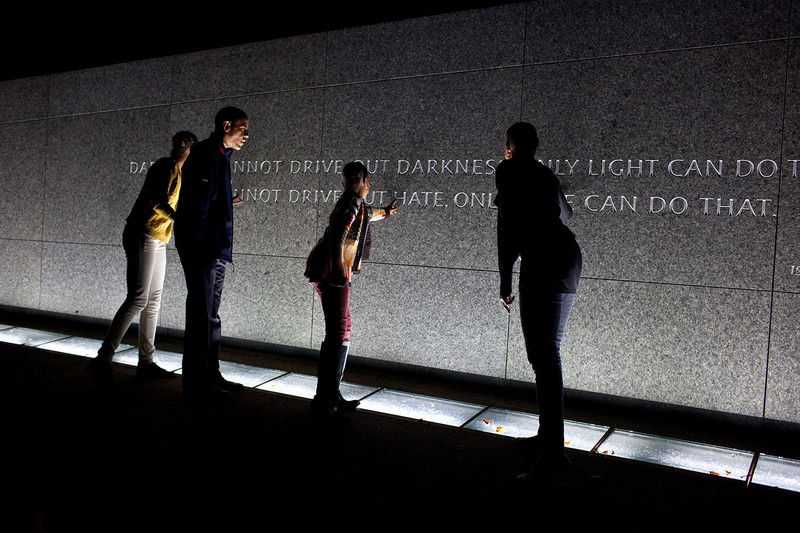 The Reach Higher initiative encouraged all American students to aspire to education beyond high school, through training programs, community college, or university. Expanding her educational goals to the international level, the Let Girls Learn program drew together resources from the US Department of State, US Agency for International Development, Peace Corps, Millennium Challenge Corporation, and US President’s Emergency Fund for AIDS Relief (PEPFAR) to empower young girls across the world to secure a quality education. 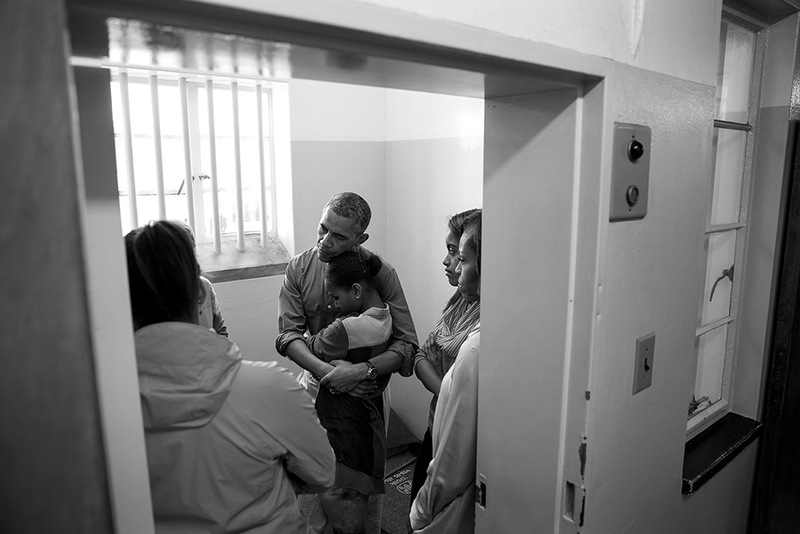 President Barack Obama and First Lady Michelle Obama share a private moment in a freight elevator at an Inaugural Ball in Washington, D.C., January 20, 2009. 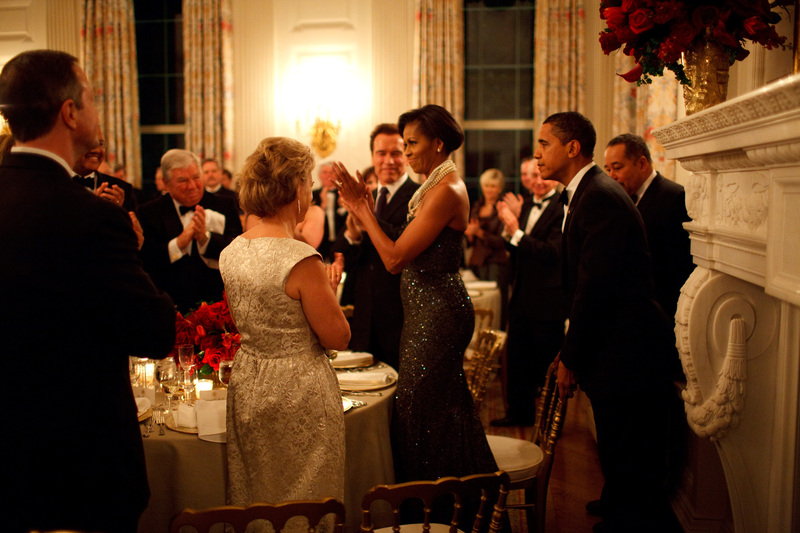 President Barack Obama pulls out the chair for First Lady Michelle Obama at the Governors Ball in the State Dining Room of the White House, February 22, 2009. 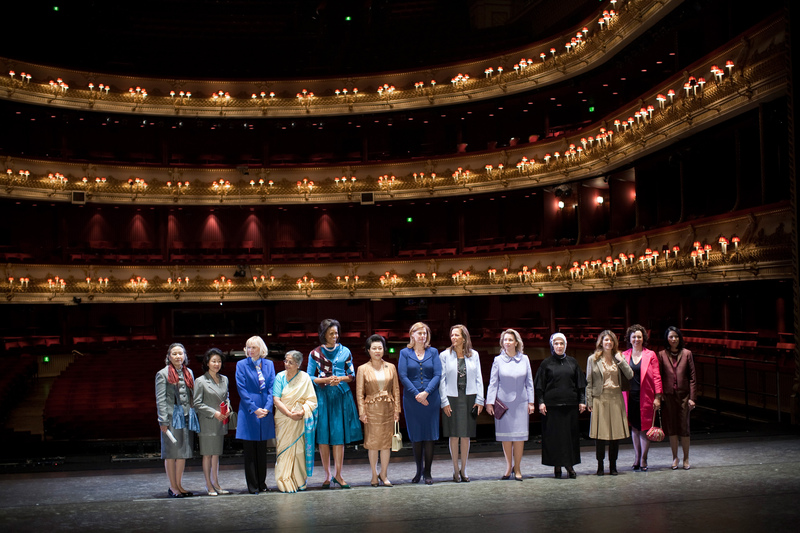 First Lady Michelle Obama poses with G-20 Summit Spouses at the Royal Opera House in London, England, April 2, 2009. 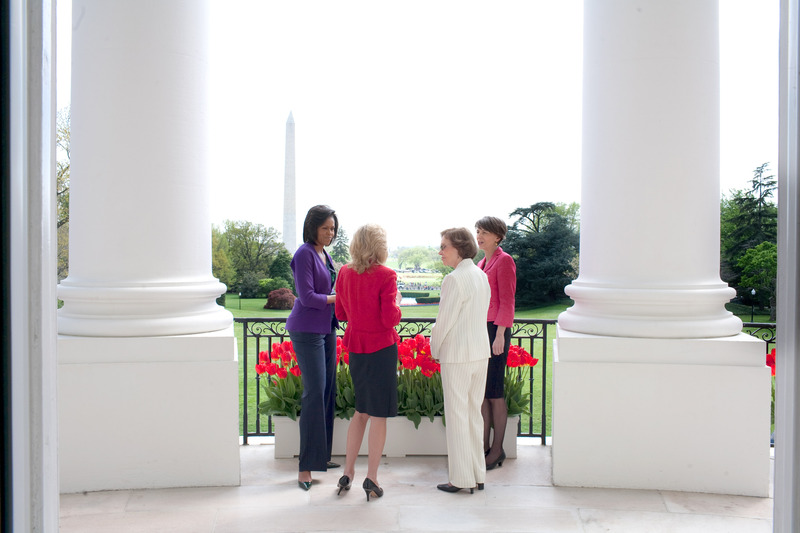 First Lady Michelle Obama hosts former First Lady Rosalynn Carter, Dr. Jill Biden, and Maria Eitel, new CEO of the Corporation for National and Community Service, at the White House, April 21, 2009. First Lady Michelle Obama attends a meeting with Communities In Schools board members at the Ferebee-Hope Elementary School in Washington, D.C., May 13, 2009. 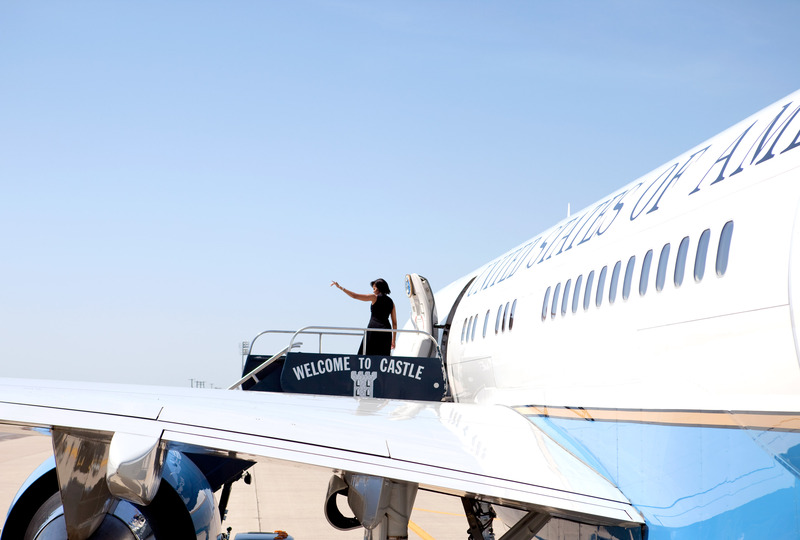 First Lady Michelle Obama waves before heading home after addressing the first four-year graduating class at the University of California, Merced in Merced, California, May 16, 2009. 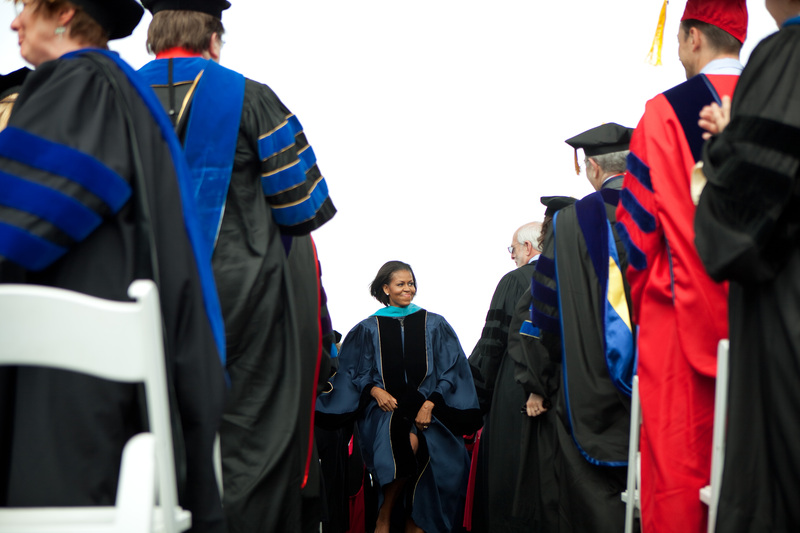 First Lady Michelle Obama attends the commencement ceremony at George Washington University on the National Mall in Washington, D.C., May 16, 2010. Mrs. Obama delivered the commencement address after students made good on her challenge to do 100,000 hours of service in exchange for a graduation speech. 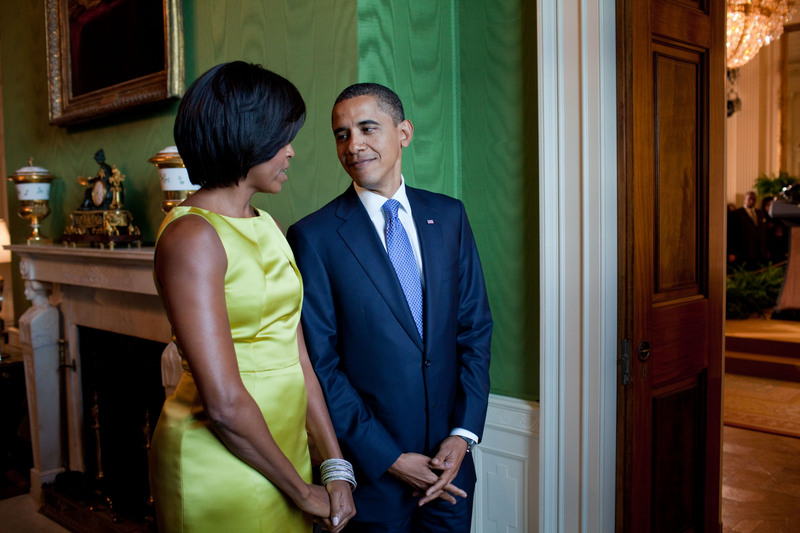 President Barack Obama and First Lady Michelle Obama wait in the Green Room before hosting a Diplomatic Corps Reception in the East Room of the White House, October 5, 2010. First Lady Michelle Obama does an interview with radio show host Eddie "Piolin" Sotelo at the Univision Radio building in Glendale, California, October 27, 2010. Piolin has one of the top radio shows in the country. 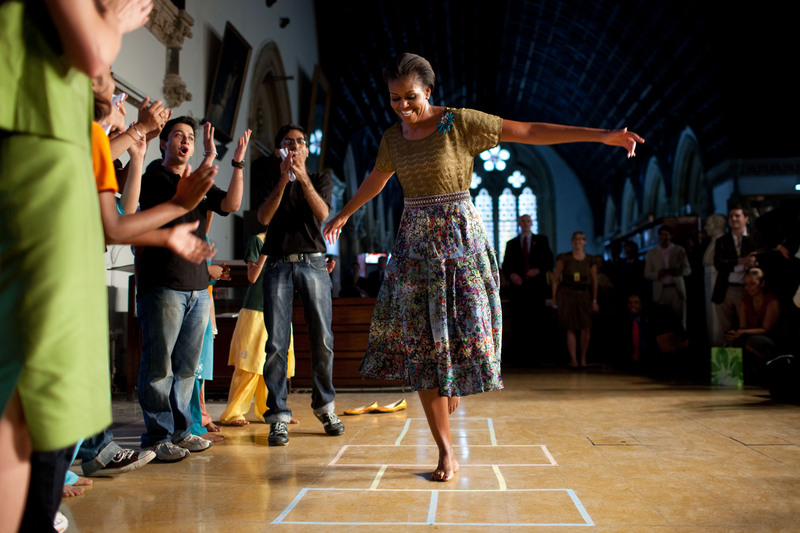 First Lady Michelle Obama plays hopscotch during the “Make A Difference” program at the University of Mumbai in Mumbai, India, November 6, 2010. First Lady Michelle Obama and Melody Barnes, Assistant to the President and Domestic Policy Council Director, third from right, meet with the Council on Community Solutions in the Eisenhower Executive Office Building of the White House, February 4, 2011. First Lady Michelle Obama and Dr. Jill Biden joke together while taping a Joining Forces public service announcement in the East Room of the White House, April 4, 2011. 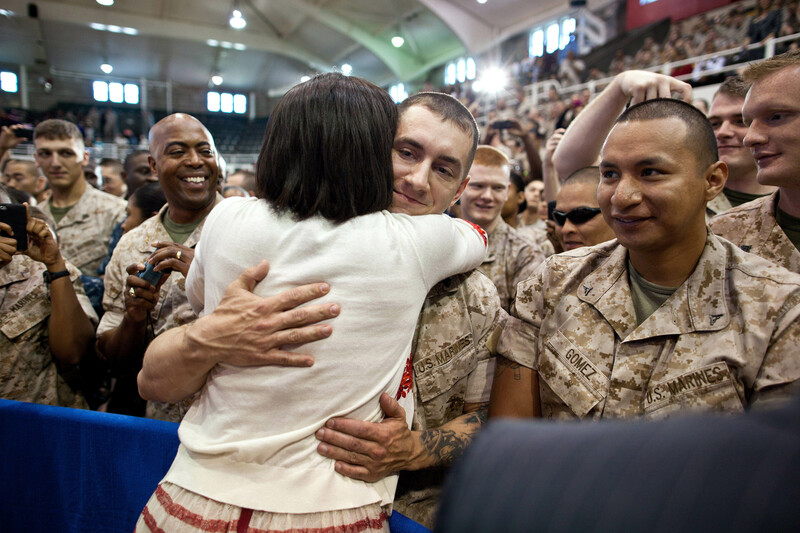 First Lady Michelle Obama greets Marines following her remarks to 3,000 Marines, soldiers, sailors, and military family members at Memorial Field House in Camp Lejeune, North Carolina, April 13, 2011. The event was part of the launch of Joining Forces, a national initiative to support and honor America's service members and their families. 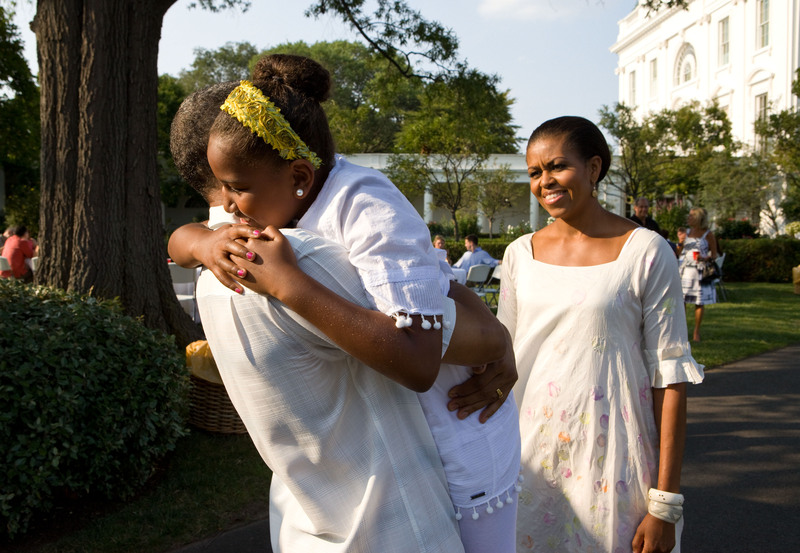 First Lady Michelle Obama and kids from Tubman Elementary School in Washington, D.C., pet Bo, the Obama family dog, on the South Lawn of the White House, September 14, 2011. 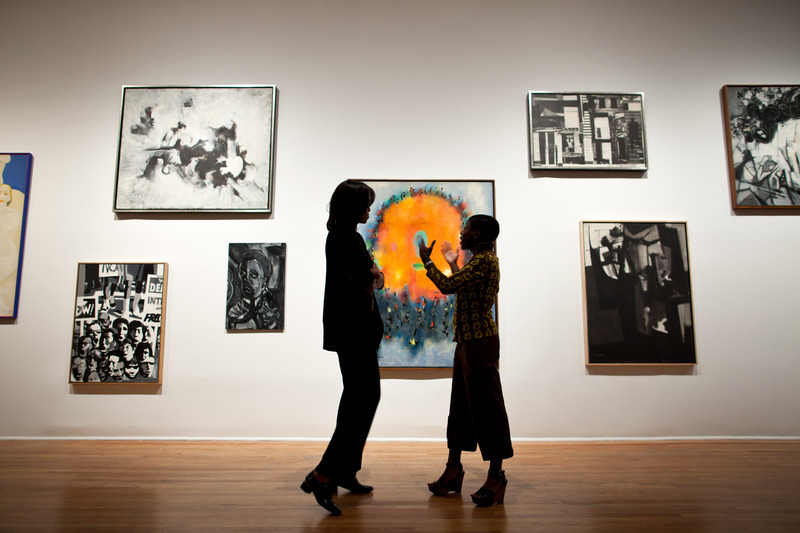 First Lady Michelle Obama talks with Director and Chief Curator Thelma Golden during a tour of the Studio Museum in Harlem, in New York, New York, September 21, 2011. 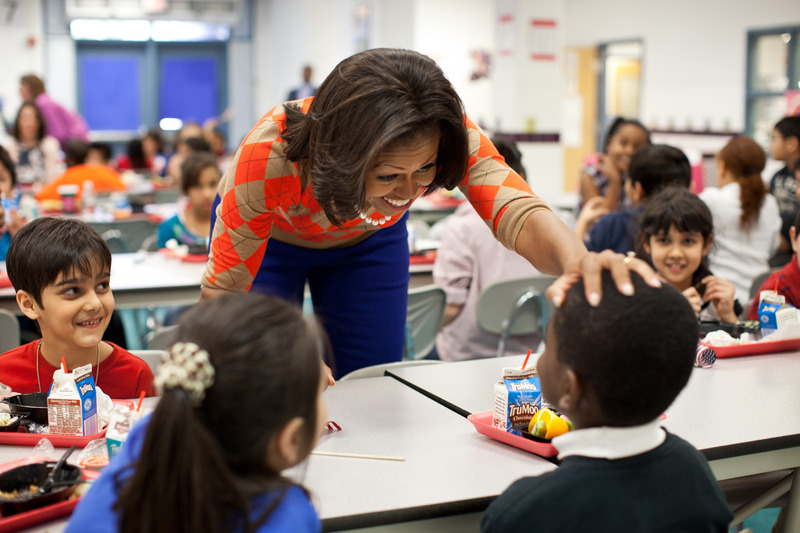 First Lady Michelle Obama has lunch with students at Parklawn Elementary School in Alexandria, Virginia, January 25, 2012. The First Lady and Agriculture Secretary Tom Vilsack visited the school to sample a healthy meal that meets the United States Department of Agriculture’s new and improved nutrition standards for school lunches. 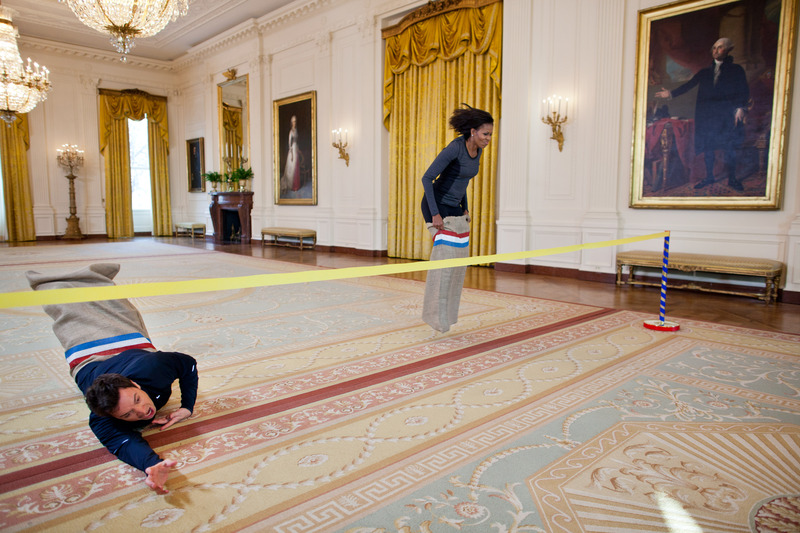 First Lady Michelle Obama participates in a potato sack race with Jimmy Fallon in the East Room of the White House during a “Late Night with Jimmy Fallon” taping for the second anniversary of the "Let’s Move!" initiative, January 25, 2012. 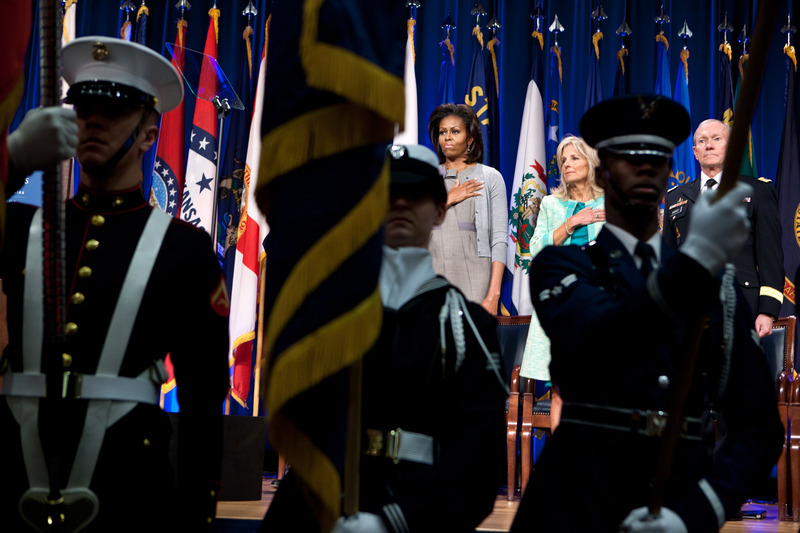 First Lady Michelle Obama, Dr. Jill Biden, and Gen. Martin Dempsey, Chairman of the Joint Chiefs of Staff, stand for the national anthem at the Pentagon in Arlington, Virginia, February 15, 2012. During the event, a report was unveiled outlining opportunities and best practices for states to better support military spouses serving in professions with state licensure requirements. 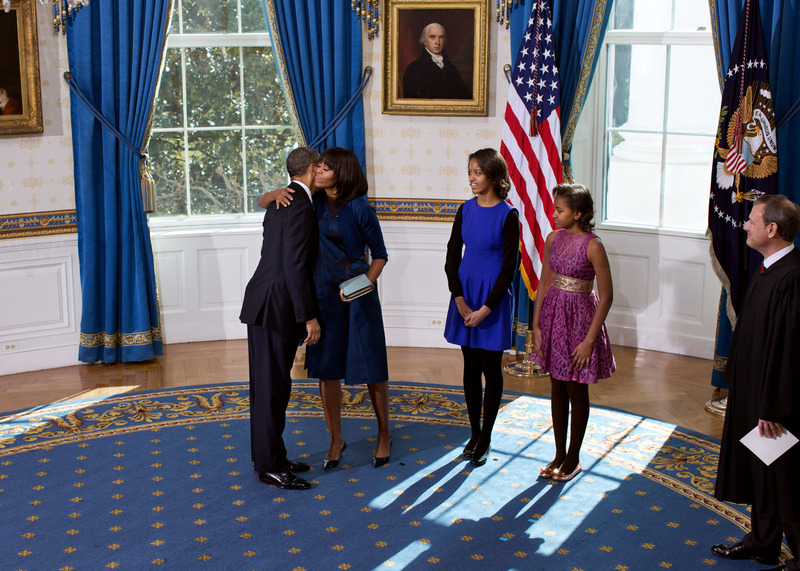 First Lady Michelle Obama participates in a taping for the “Biggest Loser" in the East Room of the White House, February 16, 2012. 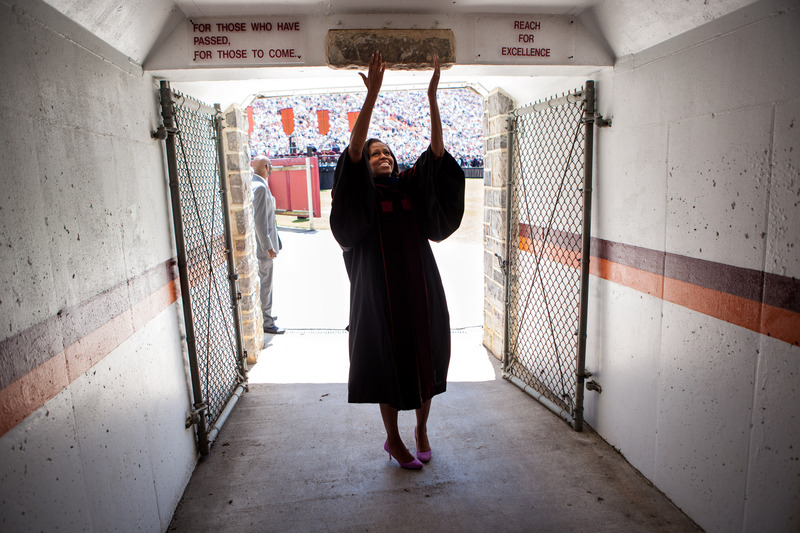 First Lady Michelle Obama touches the Hokie Stone before walking onto the field at Lane Stadium to give the Virginia Tech commencement address in Blacksburg, Virginia, May 11, 2012. 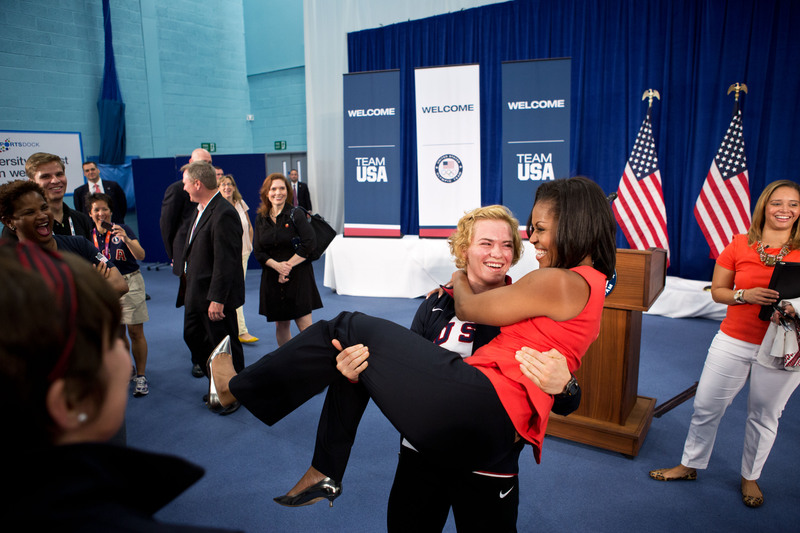 First Lady Michelle Obama is picked up by U.S. Olympic wrestler Elena Pirozhkova during a greet with Team USA Olympic athletes competing in the 2012 Summer Olympic Games, at the U.S. Olympic Training Facility at the University of East London in London, England, July 27, 2012. 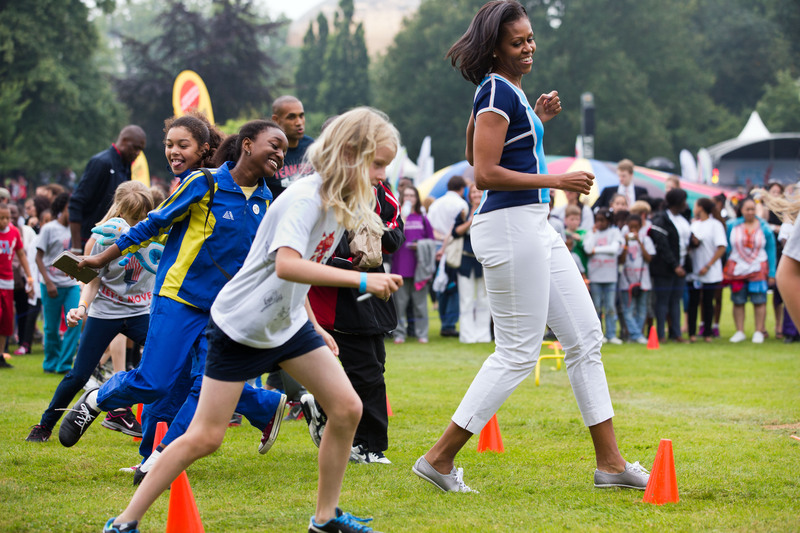 First Lady Michelle Obama runs at an activity station during a "Let's Move! 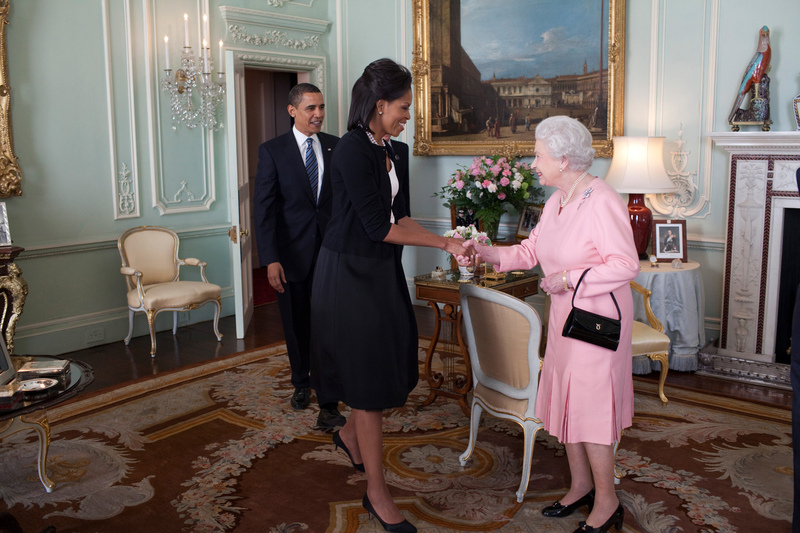 London" event at Winfield House in London, England, July 27, 2012. First Lady Michelle Obama watches the swimming finals and medal ceremonies at the Olympic Park Aquatics Center during the 2012 Summer Olympic Games in London, England, July 28, 2012. 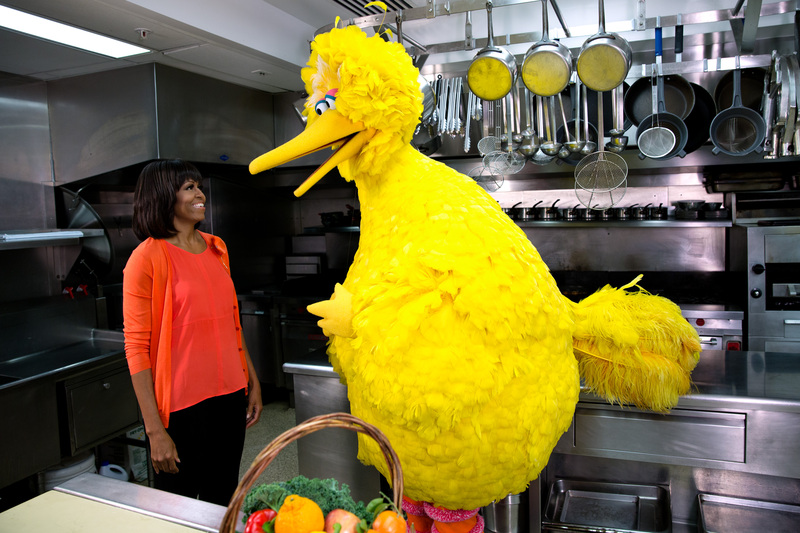 First Lady Michelle Obama participates in a “Let’s Move!” and "Sesame Street" public service announcement taping with Big Bird in the White House Kitchen, February 13, 2013. 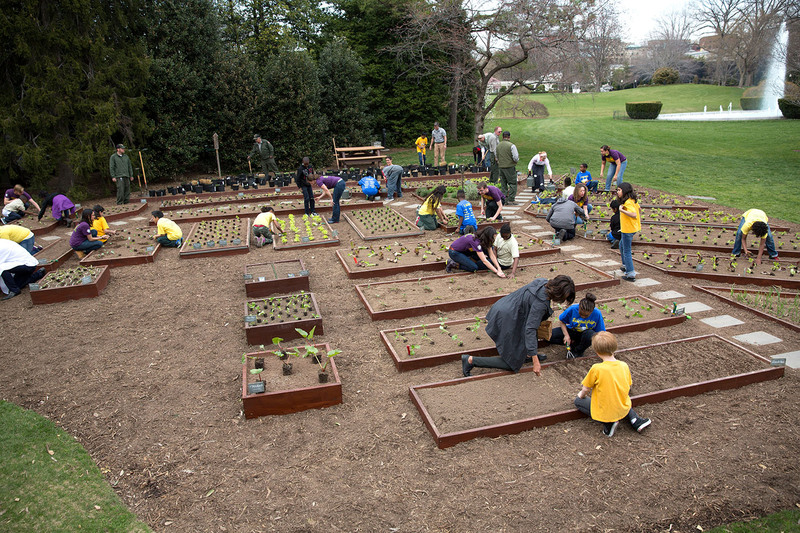 First Lady Michelle Obama and students from around the country participate in the White House Kitchen Garden spring planting on the South Lawn of the White House, April 4, 2013. Mrs. Obama was joined by students from Benjamin David Gullett Elementary School in Bradenton, Florida, Arthur D. Healey School in Somerville, Massachusetts, Sarah Moore Greene Magnet Technology Academy in Knox County, Tennessee, the Milton Elementary School in Milton, Vermont, and Harriet Tubman and Bancroft Elementary Schools in Washington, D.C.
First Lady Michelle Obama, Prince Harry of Wales, and Dr. Jill Biden help military children create Mother's Day cards and other crafts in the State Dining Room of the White House, May 9, 2013. 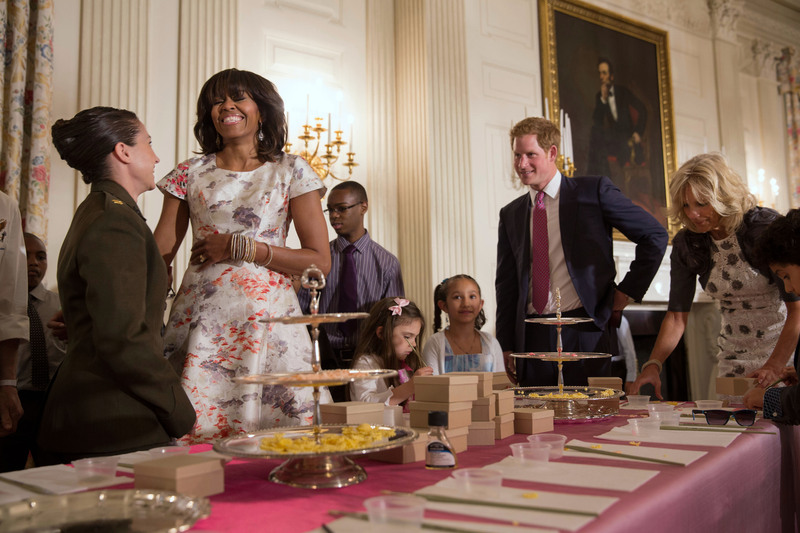 The children presented the gifts to their moms during the Joining Forces Military Mother's Day Tea in the East Room. 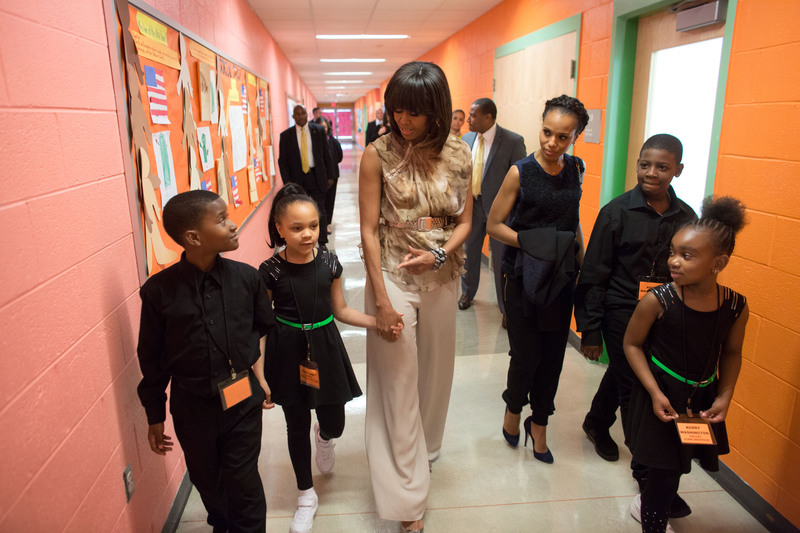 First Lady Michelle Obama and Kerry Washington walk with students at Savoy Elementary School in Washington, D.C., May 24, 2013. Savoy is one of eight schools selected for the President's Committee on the Arts and the Humanities (PCAH) Turnaround Arts Initiative. 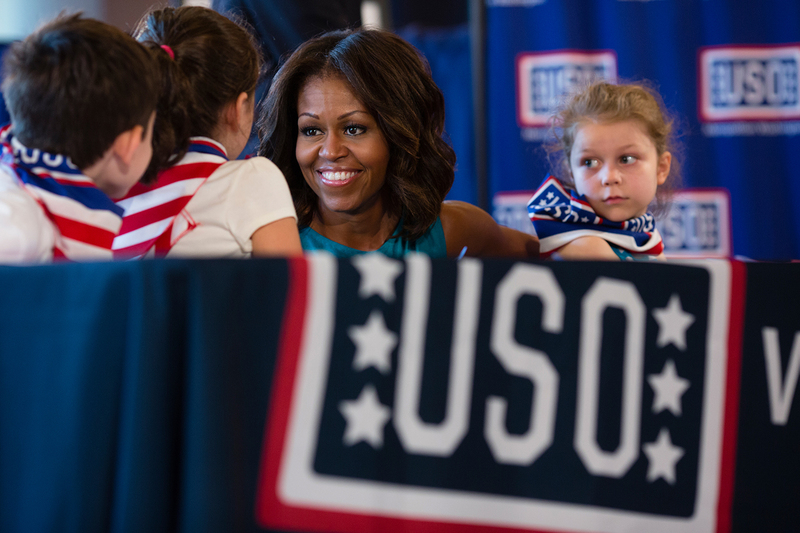 First Lady Michelle Obama talks with children at the USO Warrior and Family Center in Fort Belvoir, Virginia, September 11, 2013. The center supports wounded, ill, and injured troops, their families, and caregivers, as well as local active duty troops. 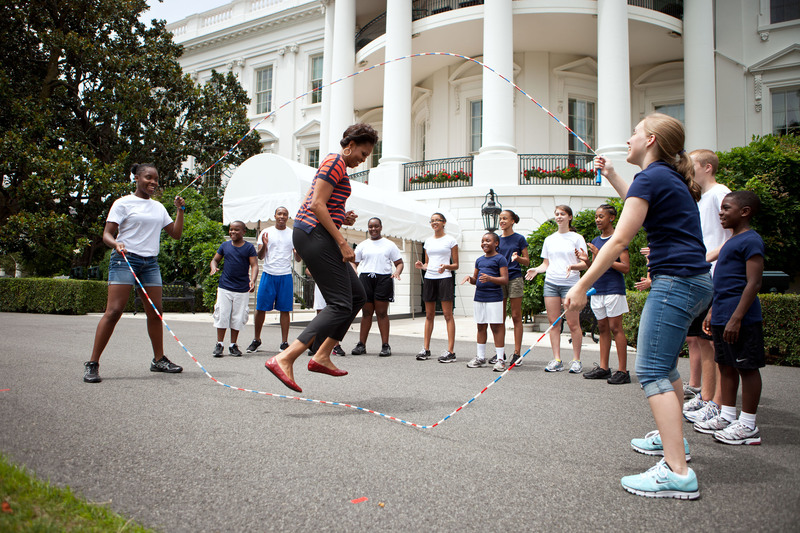 First Lady Michelle Obama tapes a "Let's Move!" 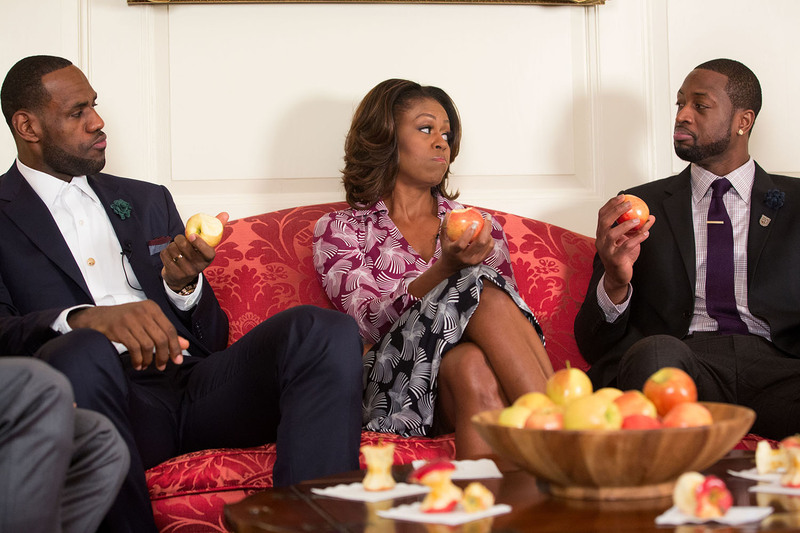 public service announcement with 2013 NBA Champion Miami Heat players LeBron James, left, and Dwyane Wade, in the Map Room of the White House, January 14, 2014. 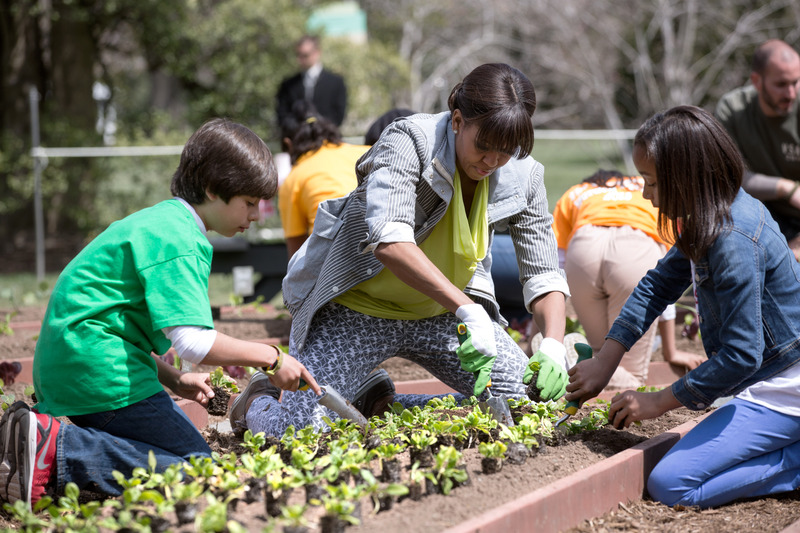 First Lady Michelle Obama joins FoodCorps leaders and local students for the spring planting in the White House Kitchen Garden, April 2, 2014. 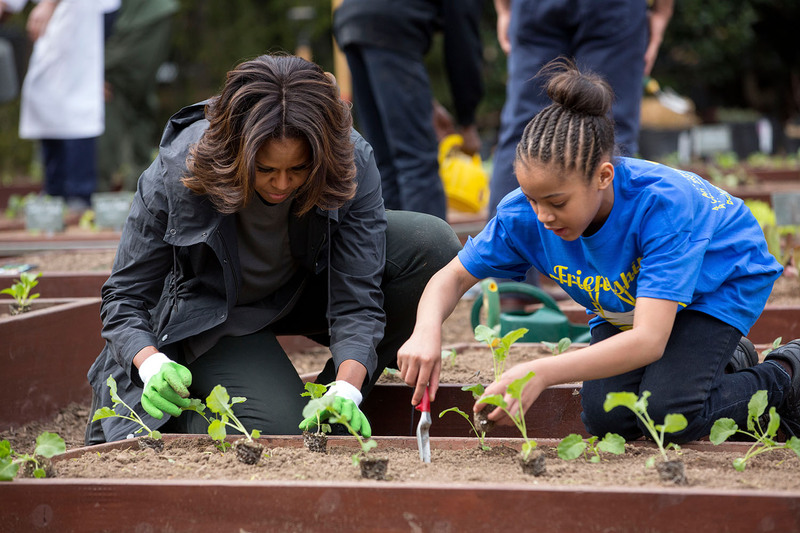 First Lady Michelle Obama joins FoodCorps leaders and local students for the spring garden planting in the White House Kitchen Garden, April 2, 2014. 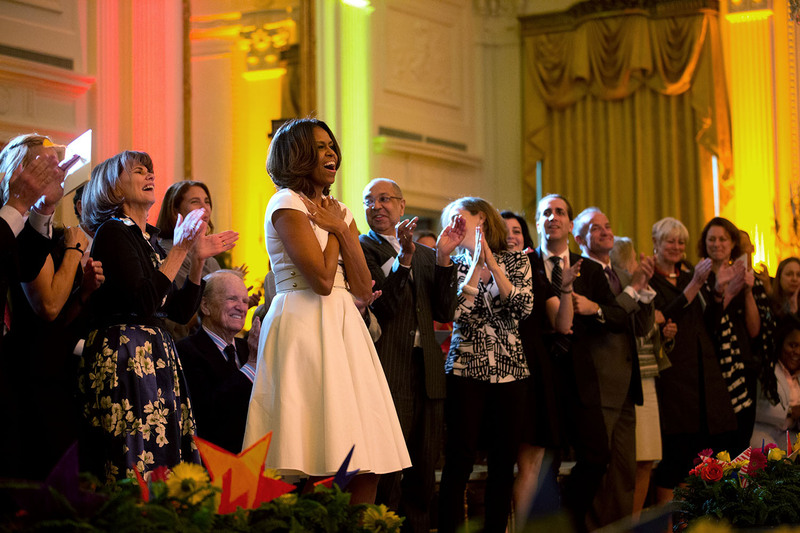 First Lady Michelle Obama and audience members show their appreciation for a performance during the White House Talent Show in the East Room of the White House, May 20, 2014. The event, hosted with the President's Committee on the Arts and the Humanities, showcases the talents of students from schools participating in Turnaround Arts, a program to improve schools and increase student achievement through arts education. 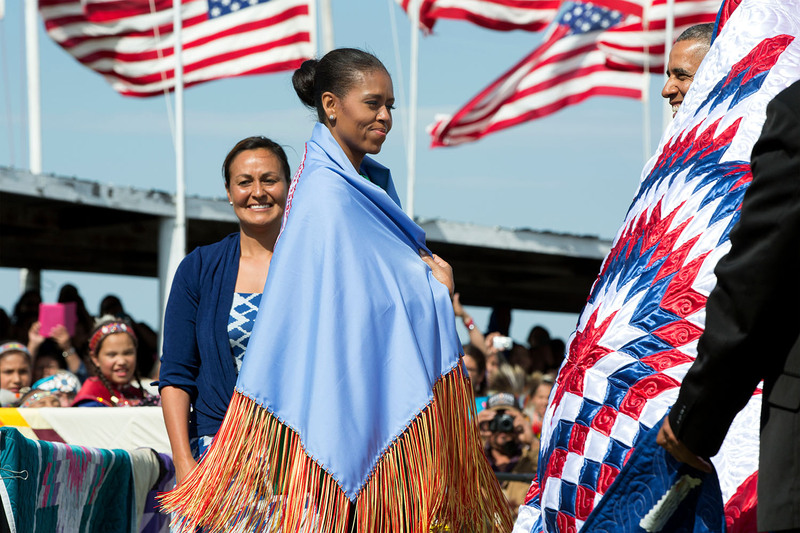 While visiting Standing Rock Sioux Tribe Reservation in Cannon Ball, North Dakota, First Lady Michelle Obama wears a shawl presented to her by Tribe Chairman Dave Archambault II and Mrs. Nicole Archambault during the Cannon Ball Flag Day Celebration, June 13, 2014. 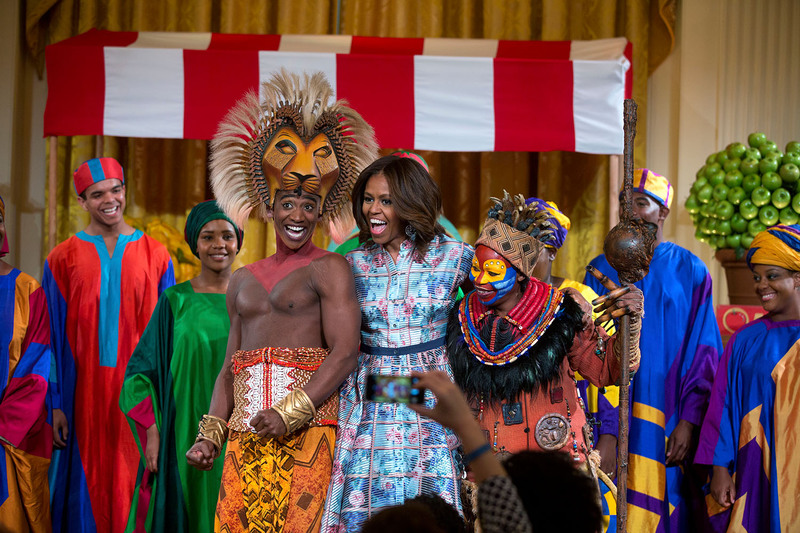 First Lady Michelle Obama joins the cast of Disney's "The Lion King" onstage after their performance at the Kids' State Dinner in the East Room of the White House, July 18, 2014. 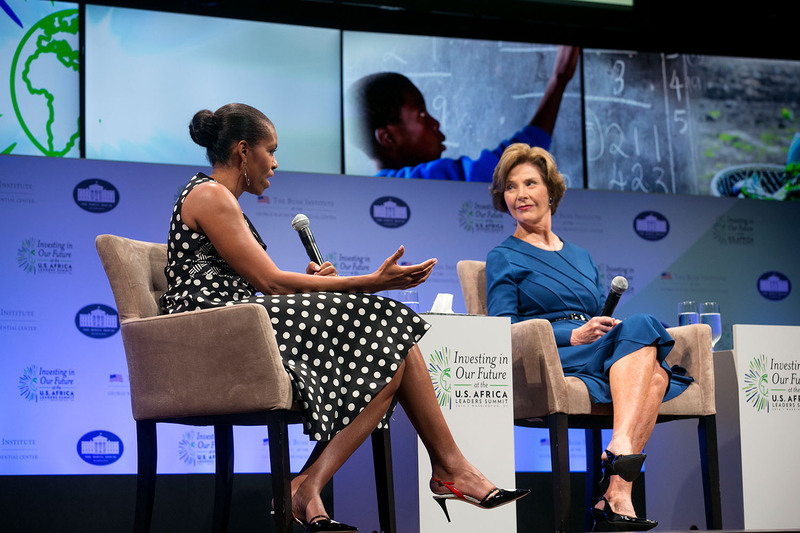 First Lady Michelle Obama and former First Lady Laura Bush participate in a symposium on advancement for women and girls in Africa, with U.S.-Africa Leaders Summit spouses at the John F. Kennedy Center for the Performing Arts in Washington, D.C., August 6, 2014. 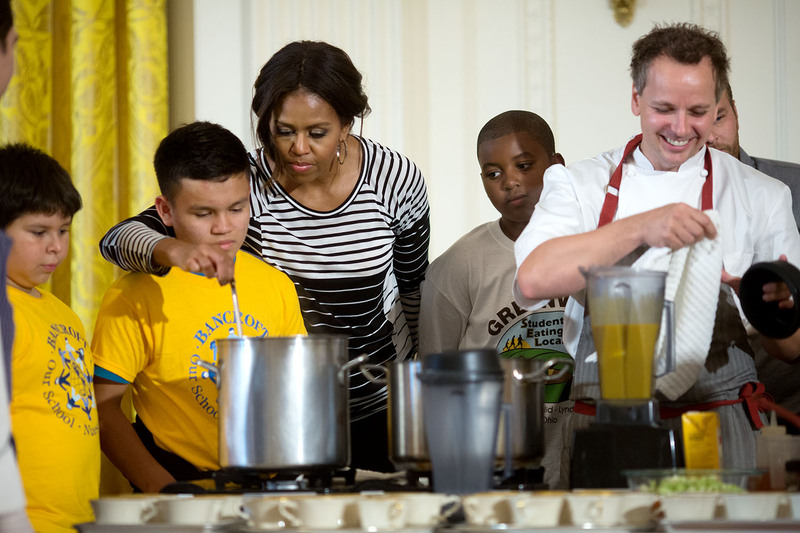 First Lady Michelle Obama and Chef Thomas Ciszak join school children in preparing the annual fall harvest meal in the East Room of the White House, October 14, 2014. 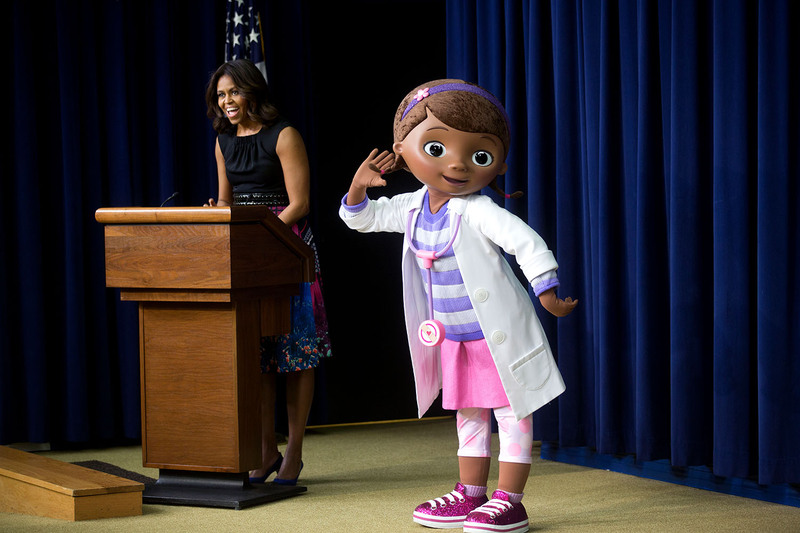 First Lady Michelle Obama delivers remarks to military children and families during a preview screening of a Veterans Day episode of Disney's "Doc McStuffins," that explores the emotions children face when a parent is deployed, in the Eisenhower Executive Office Building South Court Auditorium, November 10, 2014. 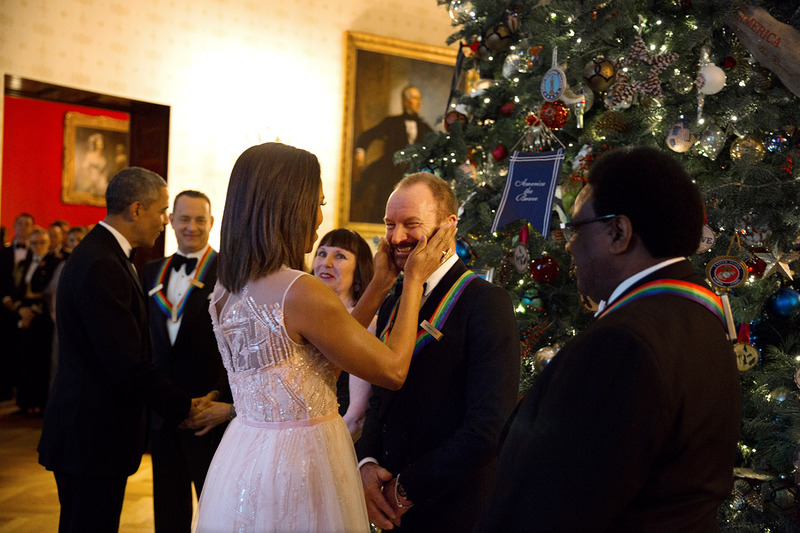 First Lady Michelle Obama greets Sting while President Barack Obama greets other honorees Tom Hanks, Lily Tomlin, and Patricia McBride in the Blue Room during the Kennedy Center Honors reception at the White House, December 7, 2014. Honoree Al Green stands at right. 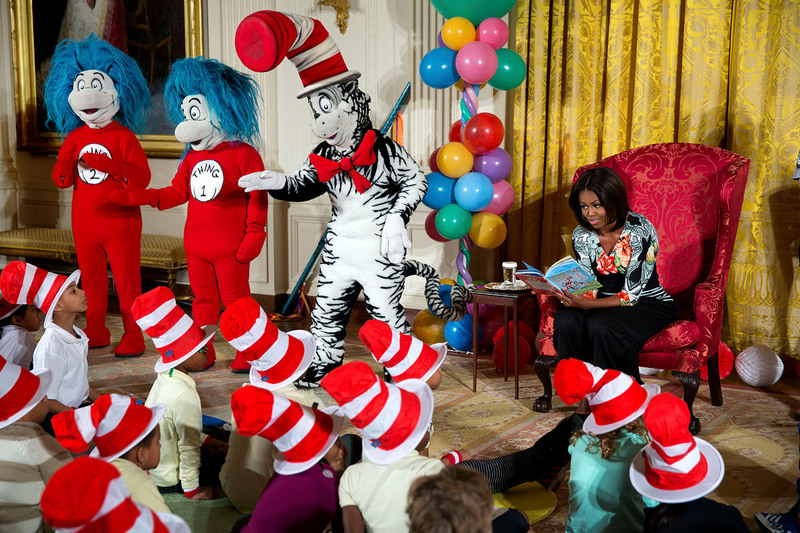 First Lady Michelle Obama hosts local students for a special reading of Dr. Seuss's "Oh, The Things You Can Do That Are Good for You: All About Staying Healthy," during a "Let's Move!" 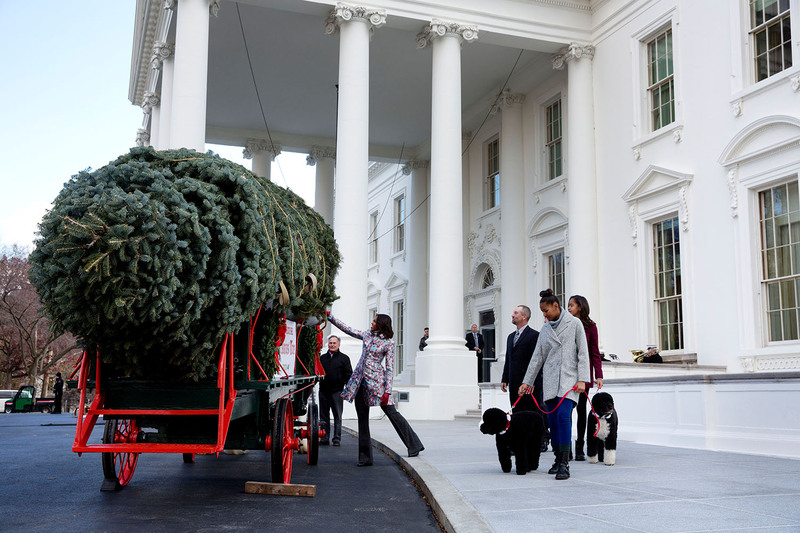 event in the East Room of the White House, January 21, 2015. 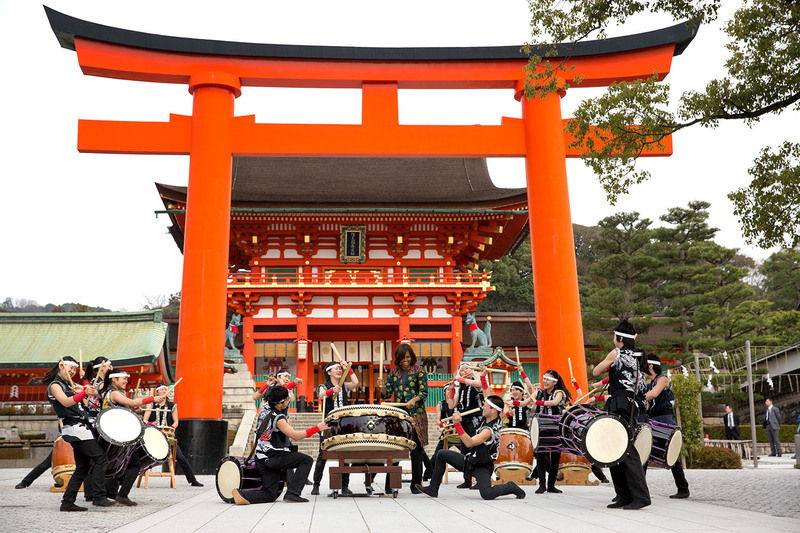 First Lady Michelle Obama joins Taiko drummers at center drum prior to a tour of the Fushimi Inari Shinto Shrine in Kyoto, Japan, March 20, 2015. 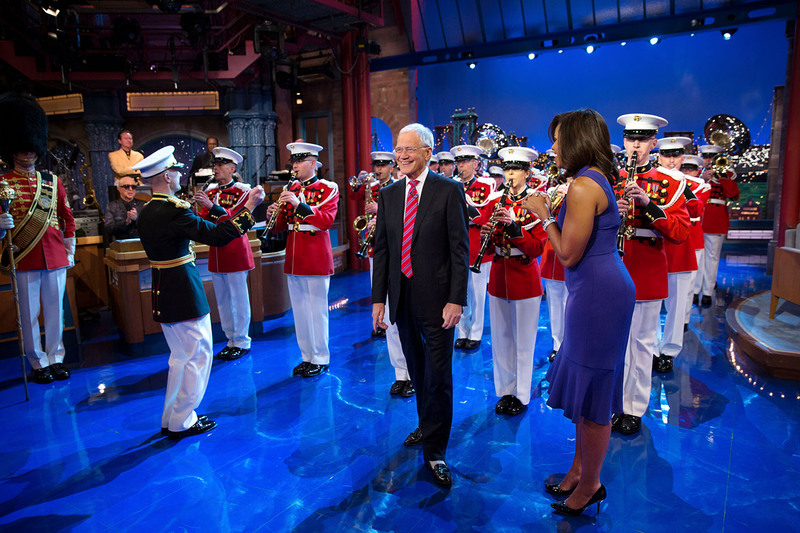 First Lady Michelle Obama surprises David Letterman with a performance by the United States Marine Band for “The Late Show with David Letterman” in New York City, April 30, 2015. 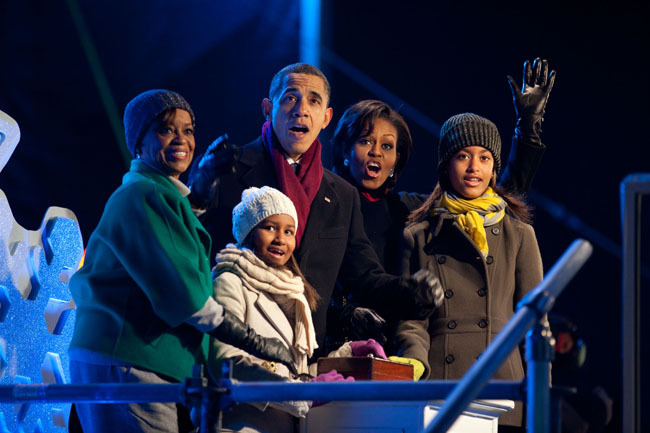 First Lady Michelle Obama reads “‘Twas the Night Before Christmas” at the National Christmas Tree Lighting Ceremony on the Ellipse in Washington, D.C., December 9, 2010.